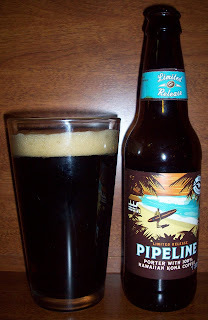 Pipeline Porter is smooth and dark with a distinctive roasty aroma and earthy complexity from its diverse blends of premium malted barley. This celebration of malt unites with freshly roasted 100% Kona coffee grown at Cornwell Estate on Hawaii’s Big Island, lending a unique roasted aroma and flavor. A delicate blend of hops rounds out this palate-pleasing brew. The beer pours a dark brown almost completely opaque with a rich off white head. There is just a slight amber hue showing through the bottom on this tumbler. Rich roasted malts, coffee and some hop bitterness on the nose. Very different; sweet roasted malts up front then a very smooth and creamy mouthfeel in the middle. The back end and finish is almost all coffee with some caramel and chocolate notes. There is also a bitterness on the finish of this beer, it’s not a hop bitterness it is coming from the roasted malts and the coffee. The coffee notes on the finish has more of an espresso bite or bitterness to it. All and all this is a excellent porter. It is very rich, almost stout worthy. But one man’s porter is another man’s stout. And since a stout is a “stout Porter” it’s only a matter of where you draw that line. The coffee in this beer is very natural tasting not an artificial coffee taste like a lot of stouts and coffee flavored beers have. This almost has an organic quality to it. I usually don’t care for coffee flavored beers but I really like this one. No I don’t mean the coffee notes that come out from a rich roasted malt, I mean a added coffee been or flavor in addition to the roasted malts. The beer has warmed to 62 degrees. It is still excellent, I really expected it to pick up some unpleasantness but it hasn’t at all. This is a very impressive, smooth and creamy coffee porter. Kudos to Kona Brewing on this fine porter. I do recommend this beer to anyone that likes a rich coffee tasting beer. Like I said earlier this beer has a very natural almost organic coffee quality to it. Very nice a solid B+ for me and that’s saying something since I normally don’t like beer with coffee added.